Three more Mondays and nineteen more days to go until eight weeks of summer bliss. My students are counting down, I'm counting down, and I'm sure you're counting down. 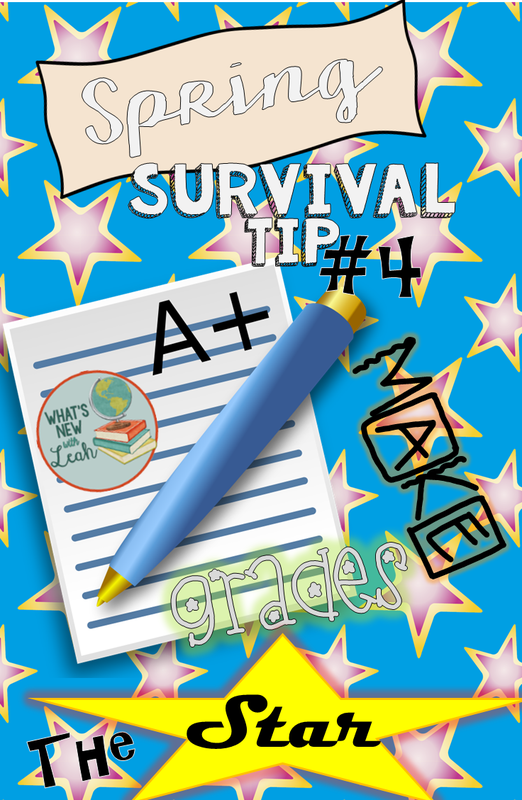 I started my Spring Survival tips series with nine weeks to go. You can catch up on them here--#9, #8, #7, #6, and #5. Today was particularly tough, especially with the seniors. They are ready to be out and get on with their lives. Often (especially here at the end) they have to be reminded that they need to do something in order for that to happen. As a matter of fact, even my most apathetic students don't actually want to fail (they may say that they do, but they really don't want to have to take the course again). I don't mean bog yourself down with endless papers--we're just as exhausted as the students. But with kids, if something's not right in front of them, they often don't think about it. And guess what's always right in front of them? Yeah, their phones. Stick a print out of their grades in front of them instead. Let them see how much those zeros matter. When I give a mini-lecture with cloze notes, while they're working on a group or independent activity, I walk around the room and initial their cloze notes. As they finish the activity, I walk around and initial that (my students do interactive notebooks, so I don't take up many daily work papers). If it's a pair-share or a "hold up your whiteboard activity," etc., I mark down whoever isn't participating. Then I decide which grade I'm going to count for the day. The next day, while they're working on their bellringers, I tell them to open their notebooks to the page I am counting. If it has my initial on it, I tick it off on the grade sheet I keep on a clipboard. Participation grade--instant accountability. The strange thing is, they really want the initial and the credit. I've found that it motivates them more than an open-note quiz ("I don't have to take the notes--I'll remember everything"). There are high-tech ways to do this, of course, Class Dojo, Nearpod.... But we don't always have access to these things. And I give quizzes and tests and try to vary my forms of assessment, but for an easy way to keep them on track, an immediate initial, check off, and into the grade book works great in my classes. They need to know that these last few weeks count. If I don't check them off--they check themselves out. How do you motivate your students to complete their assignments at the end of the year? Leave a comment below to let me know! 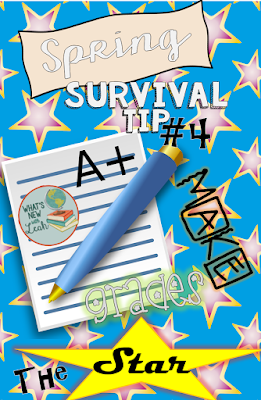 Also, be sure to check back in next week for Spring Survival Tip #3.